Beautiful new Airflow bodies . . . tailored to taste! Airflow styling at a new peak of streamlined symmetry! These Airflow bodies are longer . . . lower . . . wider . . . roomier! A new front end that seems built for easy speed! Lines that flow smoothly over the low rake of the windshield and down the graceful, sloping back! Space-flared bodies that bell outward below the window line, suggesting the lavish roominess within! Nested head lamps in the streamlined fenders! Even the door handles seem part of the chromium belt moulding! 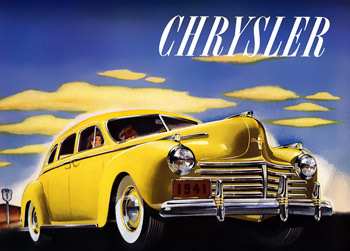 We’d like for our excerpt from the 1941 Chrysler sales catalog to have been longer, but we ran out of exclamation points. 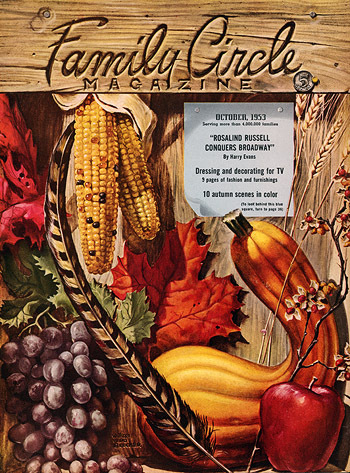 The fall colors were nothing short of spectacular on the cover of the October 1953 issue of Family Circle, a trompe-l’oeil illustrated by William Ward Beecher (1921-2006), a painter associated with John Steinbeck and a relative of Henry Ward Beecher and Harriet Beecher Stowe. 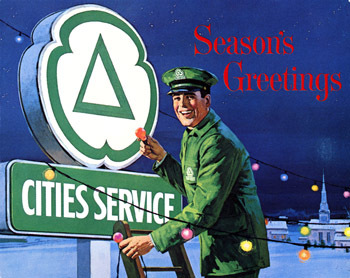 A greeting card for the Cities Service gas station chain, circa 1960. 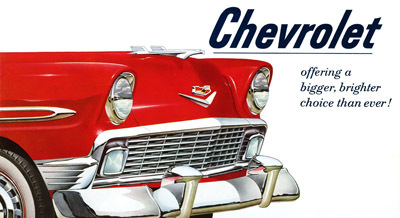 In each of Chevrolet’s three great series, fine-car quality has been delightfully blended with heart-stirring, high-stepping performance. Each series has a fresh ’56 look of its own — intriguing variations of speedline styling from crisp new grille to rakish rear fenders! Each with its own distinctively styled two-tone upholstery and trim! In many models, Custom-Colored interiors at extra cost. 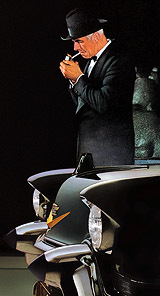 Below, the back cover of the same brochure. The left taillight lifted up to reveal the gas filler. 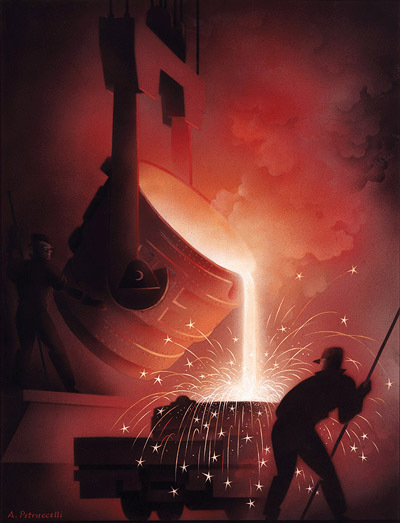 For the second year we're happy to offer the Plan59 limited-edition holiday print, made from an original 1938 painting by the noted Fortune magazine illustrator Antonio Petruccelli that we purchased at auction in New York. Click on the image below for details. 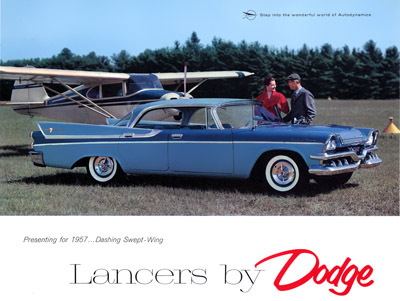 Lancer by Dodge — even the name is exciting! And any ideas you have about the “sameness” of cars will vanish the moment you slip behind the wheel. For here is the car that brings adventure back to motoring. Here is a car so brilliantly styled, so exhilarating in performance, so rewarding in pride and prestige that driving it is a thrilling new experience. And here is a promise: Make a Lancer your choice and you will rule the road in style and power! Step into a Swept-Wing Dodge Lancer today! 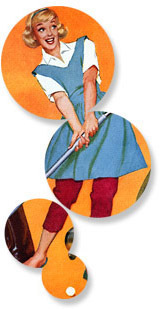 From 1957, the cover of a sales brochure for Dodge hardtops, a.k.a. Lancers. Which might be worth looking into. High on our list of aspirations is ruling the road in style and power. Whether you just bought a new model or have had that car of yours for years, take advantage of the big new advance in engine lubrication: Custom-Made Havoline Motor Oil. For any car, new or old, this Heavy Duty motor oil means more power, improved gasoline mileage, longer engine life. 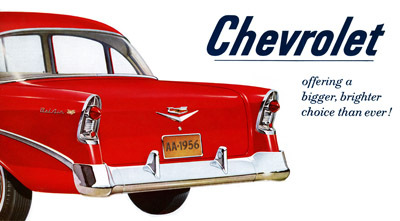 For Custom-Made Havoline, see your Texaco Dealer, the best friend your car ever had. 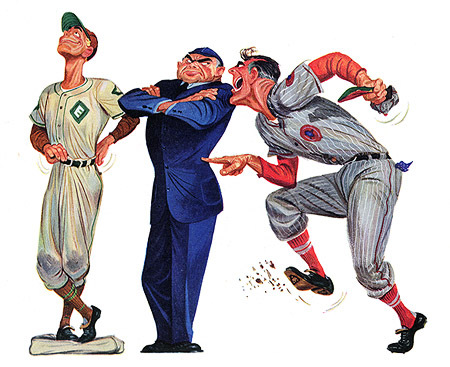 From 1952, a lively illustration in the service of “custom made” Havoline, evidently one of the first artisanal motor oils.